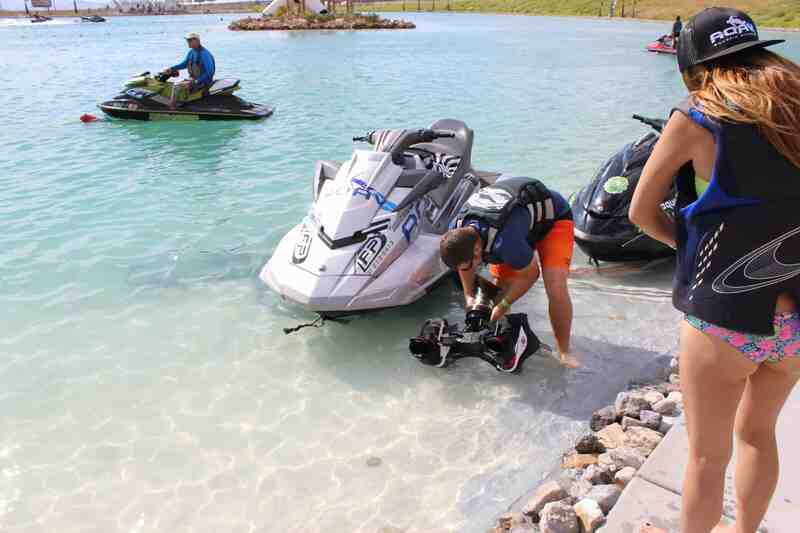 The world of hydroflight sports came together this year for the “first-ever water jetpack sporting competition and festival.” Aquatic Aviation helped sponsor Hydro-Fest. We were so excited to hear about such an awesome event and were happy to attend representing Zapata Racing. Hydro-Fest was free, open to the public, and featured demonstrations from all the major brands and manufacturers in the Hydroflight Industry. Flyboards, jetpacks,jetbikes, jet…chairs? You name it! Everyone who attended could try out all of the different toys. We shot a video highlighting the Flyboarding portion of the event. The video is to promote the riders of the sport and showcase their talents. Hydro-Fest took place at Lake Spring Mountain in Pahrump, NV. About an hour from Las Vegas, there is an oasis in the middle of the desert, commonly referred to as Jetpack-Lake. Clear water, white sand, and people everywhere having a good time. The competition portion of the expo consisted of four categories: Jetbike, Jetpack, Women’s Jetboard, and Men’s Jetboard. Scores were dependent on difficulty of the tricks, how well tricks were executed, the height and power used, variation, and whether or not the trick has been seen before. You may recognize winner Kristen Smoyer, who also just won first place at the Flyboard World Cup in Naples, FL. The festivities did not end at sundown. There was also a light show by the amazing hydrosport team Jetpack Invasion! Riders wore LED suits, headgear, and decked out their equipment in lights as well. Images were projected onto the spraying water from the jets and resulted in a beautiful performance. Jetpack America, for organizing the event. Spring Mountain Motor Resort and Country Club for the beautiful venue. Eric Longabardi, media director of Jetpack America for letting us shoot our video. Follow us on social media for updates on upcoming Flyboard events. Hi there , if love to be a part of hydrofest 2017. Have been FLYBOARDING for a few years and love it . How does one get tickets to come ? Would there be a possibility of renting a houseboat or yacht ? Awesome, welcome to the Flyboard community! Hydro-Fest 2016 was a free event and anyone could attend. No tickets were involved, you just showed up. Details on Hydro-Fest 2017 have not come out yet, but we’re hoping it will be a free event again. The lake is not exceptionally big, so you won’t be able to rent a houseboat or yacht. Water space is reserved for Flyboard athletes, swimmers, paddle boarders, and other toys. We’ll post information as we receive it on our Facebook Page. You can also follow the Hydro-Fest 2016 Facebook Page. Thanks for your questions and we hope to see you this summer!